The Digital Transformation of Museums- How museums are going online! Home/Blog/The Digital Transformation of Museums- How museums are going online! Because digital technologies can help museums and other cultural institutes provide the audience an exceptional and personalized experience. In a world where maximum things are online, museums are too embracing the ways to display their museum collection online. A series of questions have been revolving all around in our mind- how people use museums now and how they will in the future or how museums can improvise the way they used to serve the community! What we are going to discuss below is how museums are going online with their collection. With the constantly evolving capabilities of museums for representing art and communicating with the audience, moving ahead with the technology has actually become the driving forces in how museums are adopting the changes. So we came with an amazing solution for museums wherein they can easily display the huge artifacts which are found to be difficult to display on the walls of the museums. The force of growing internet and social media demand has brought museums to put their efforts to create more interactive educational and exhibition programs. Perhaps this is to reshape the museum’s ways to display their art and sculptures to those who aren’t able to make it to museums. In the sense, they can sit at any part of the world and view your collection online. Embrace new technologies to better understand your audience by creating a broader and more engaged audience base. For museums, the most important thing is to know the visitor’s base. By grabbing the interest of the visitor’s museums can offer a more educational and engaging experience by displaying the artifacts online. Our solution comes with analytics which will allow you to collect visitor’s data analytics on artifacts that are Most Viewed, Most Shared, and Most Favorite etc. So now leverage the collected data for more effective and engaging content for your audience. The collection online can help you educate the audience by providing a detailed information related to the artifacts. They can view the categories of the collection and can save or mark as favorite which can later be used for their research work or for study purpose. Technologies have created great opportunities for museums to display, track and get proper analytics. 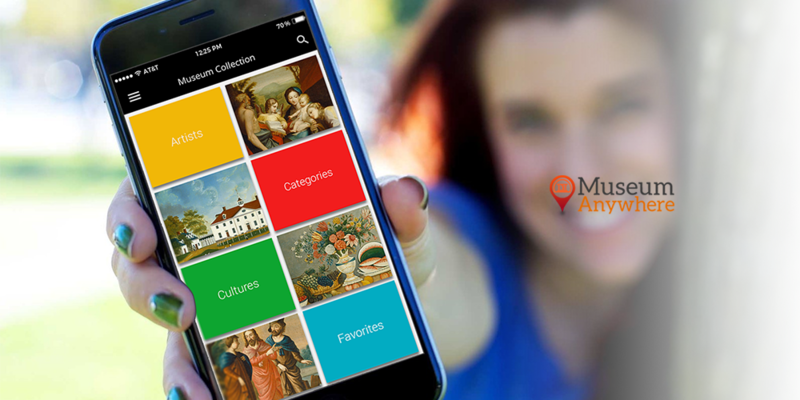 To implement the museum collection online, talk to our expert at sales@MuseumAnywhere.com or call 703.652.6630. Previous Previous post: Are you still using Audio Tours? Turn your visitor’s walk with audio and video tour!